I am not sure I want a pair of white pants. I think I recall Clinton and Stacy saying that they don’t work well for broad-beamed girls. But I do really want them. And just like this blogger I know I would look fantastic in them paired with a 3/4 sleeve nautical striped tee and Sperrys. Even with a white wine spritzer and I don’t care for white wine. But, being Southern, or more importantly, being raised by Southern grandmothers at every corner of my life, I know white pants are like white shoes. They don’t make an appearance until after Easter. 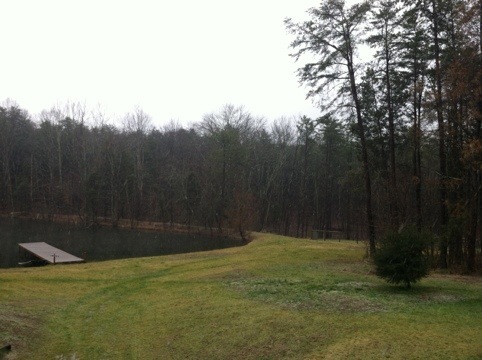 It’s just now starting to sleet here good. 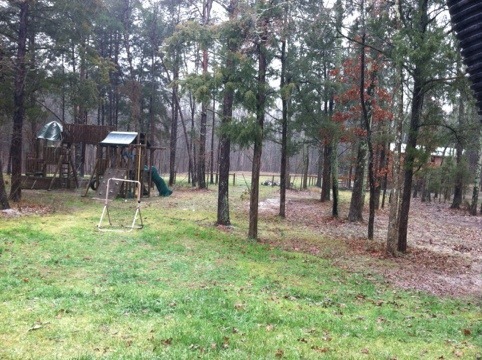 The weather should turn to snow soon. It’s a pretty exciting thing to get snow down here in the south. And our first shot at it this winter. We have a Hee-Haw DVD playing. Cathy Barton and Kenny Rogers are guests. Such good fun this is. I’ve been taking a break from knitting (Rebekah Anne’s shawl !) 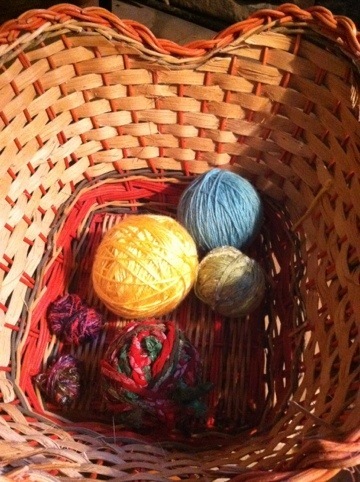 by winding what yarn wasn’t tangled in the kids’ yarn basket. Good thing we visited The Twisted Knitter yesterday and the kids each chose a new skein of yarn. There ain’t much in that big basket! Yesterday I made my BBQ sauce and slaw and then I cooked a picnic shoulder overnight. So dinner’s done! 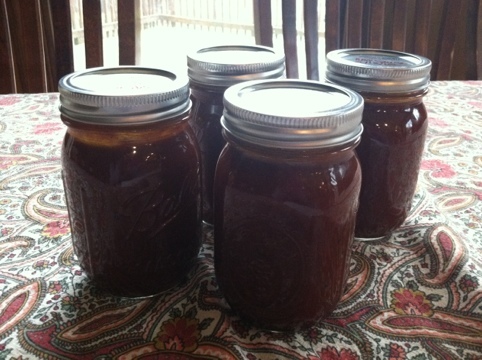 And I doubled my BBQ sauce recipe and put up 4 pint jars and 1 quart jar of the sauce. Canning makes me very happy. 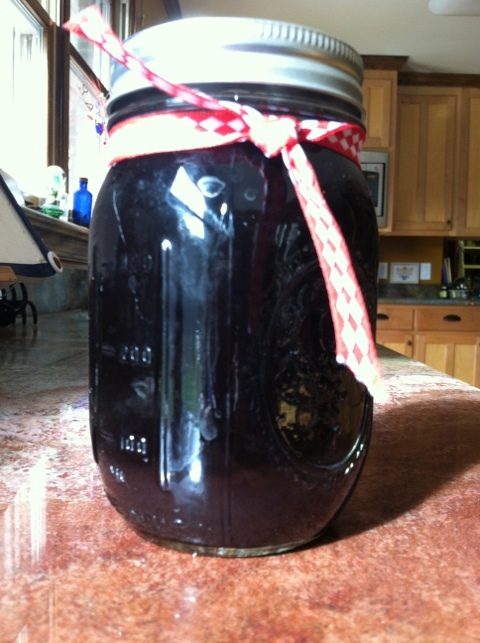 Something I’ve been canning a lot of lately is my Elderberry Syrup. I offer it to my local folk for $8 pint. It’s good for all kinds of things including colds, allergies, and blues. A quick google search will lead you to lots of recipes and information. Right now I use all organic ingredients except for fresh ginger root and local honey. Hopefully I will find good organic sources for those, too, soon. And now … in the very short time I took to write this post, it is snowing… I suppose now we really should assess our ski gear. Which will of course be just sledding gear. Until lunch tomorrow when it’s all melted. A perfect snow. It’s quite amazing how just adding blogging adds to my day. Just the simple act of stopping to spill my brain for a few minutes. Well, it’s Tackle It Tuesday and I originally posted how my goal was going to be listing at least ten lots on eBay. But that’s changed. I’ll still aim to get the lots done, but now I am aiming for five. Because I plan to read instead. The oldest two have had the opportunity for an impromptu dissection of a fresh deer brain, heart, and trachea. How cool is that? A super cute, hip lady with deer stuff laid out over her cute, hip home. Cool! So they’ll be spending their morning otherwise occupied. That leaves me the three little ones. And I think we’ll go back to bed until lunch. And they can read to me. They can practice reading aloud to me while I rest my sinus-swelled head. How lovely! Stopping is a challenge for me, so I truly am having to Tackle this. Once the olders return home, and lunch is made, I’ll make the cheese straws for a meeting and post a few listings to eBay. After I am read to. Menu Plan Monday – I’m baaaack! This week as I participate in Orgjunkie.com ‘s Menu Plan Monday, I am also returning to blogging after a two week break as well as offering a brief review of a book. Aren’t I talented? SO, this new fascination with a book, as usual, started at the library. Yes, yes… I know. Government money. I’ve never called myself independent of the government and no, I do not believe public libraries are a necessary government expense. What I do know is that most, at least where I have lived, libraries are nearly fully funded by the communties in which they exist. Yes, they do receive some state and federal money, generally through grants. Mostly, however, the county and city governments fund them. And this is how the “extras” (including welfare hand outs) should be – decided by and funded by the communities served by the extra. Not by those miles and miles away. So, in short, if our public library were to shut down tomorrow, I would not be upset. Disappointed, sure. But not upset. And I *do* believe individuals would/will work out their own lending library system much like several homeschool communities already have. We were at the library and I like to check out the “new” books shelves. And, because I *do* judge books by their covers, I saw this almost monochrome spine with the words “The Stocked Kitchen” on it. Well, I do like a stocked pantry, so I picked it up. And began a love affair. The Stocked Kitchen by Sarah Kallio and Stacey Krastins is 300+ recipes for appetizers, breakfast/brunch, soups, side dishes, main entrees, and desserts ALL made from a single grocery list that does not contain a lot of obscure ingredients. So the concept is that a person keeps the grocery list (it even comes with tear-out grocery lists) on hand and then can make a lot of different recipes on the fly. And it’s true. The recipes are easy, quick, and simple. The 10 – 15 I have tried thus far required few ingredients, and were so quick to make, that I actually had to THINK of ways to stall the process so that I could use the crock, or prepare ahead. And let me share… They even have a FREE iPhone/iTouch app with the list in it. No kidding. Italian Stew (sans pasta), a new family favorite. Cream Cheese Coffee Cake, yum! Cinnamon French Toast Bake, best french toast bake I’ve ever made AND kids ALL ate it. Asian Lettuce Wraps, made with lettuce from our garden, delicious! Empanadas with Cajun Aioli, Must.Have.Again.Soon. And there are a few others, but they are not recorded for some reason. Now, I am not an “all-in-one” kind of gal, so I cannot abandon all my other goods for this one system alone. And I won’t switch from dried beans to canned beans, etc… What I can say, though, is that I did buy this book from Amazon (for$16.15, it retails for $24.99) and it is no doubt going to be worth it. And I don’t even BUY cookbooks anymore. There’s already so much online already. So… This book is worth every penny for me. It certainly makes meal planning easier because I know I will have MOST Of this stuff on hand because these recipes are made without expensive-hard-to-find-one-use ingredients like tahini. And I can handle that. Oh, and no. I am not being paid to write this review. This is my honest opinion. I have marked all of The Stocked Kitchen’s recipes with TSK after the name. So, see if your library has this book and give some of these recipes a whirl. The main groceries we visit each have what I call the “bent meat shelf.” It’s where the meat products that are about to expire live until they must be trashed. There are often lots of goodies including antibiotic-free chicken, the perfect cuts of beef for jerky, and even occasionally, deli meat. I figure that as long as it is purchased before the “by” date and frozen immediately when we get home, it’s good. And we’ve yet to get sick that way, so I’ll keep on buying meat that way. Easily, 1/2 of the meat we eat comes from the bent meat shelf. Some days there’s nothing and some days it’s a jackpot. I just won’t buy fish that way. Well, for tonight’s meal, I had only planned “crock pot” in hopes that what I wanted would go on special or be found on the bent meat shelf. I’ve used our reserve and so I was truly hopeful. And sure enough, Sunday, *voila*! Whole cut up chickens and split breasts were on the bent meat shelf. The good chicken, too. The two whole chickens were put in the freezer and the split breasts were grilled that night. The leftover meat from the breasts was used in the Chicken & Black Bean Enchiladas for last night, which are delicious and best when made with homemade enchilada sauce, and dried black beans rather than canned. I wouldn’t typically want to use chicken again tonight. But I wanted less to go to the grocery this morning. So last night I took one of the whole chickens and set it in the fridge to defrost some and this morning I put it in the crockpot for insanely good Adobo Chicken. It’s so easy. It’s a recipe from allrecipes.com, but I’ll post it here, too. It’s just that easy. We’ll bake rice in the oven, add a spinach salad and enjoy a fresh, easy meal tonight together. Place chicken in slow cooker. In a small bowl, mix all other ingredients and pour over chicken. Cook on low 6-8 hours. In a casserole dish, put rice and the normal amount of water you’d use on the stove. (for example, the stove requires 2c water to 1c rice) If using brown rice, use 1.5 times the normal amount of water. Add either a bouillon of vegetable, beef, or chicken stock or add one packet of Lipton onion soup mix. We prefer Better than Bouillon Vegetable. Dot with butter, cover with foil, or a lid. For white rice, bake for 30 minutes. For brown rice, bake for one hour. Perfect results every time. And easy clean-up. Menu Plan Monday – OK. I’ll confess. OK. I’ll confess. 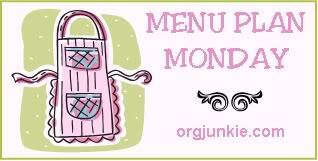 I like Orgjunkie.com ‘s Menu Plan Monday. I like it because I am forced to think ahead. I like it because it makes shopping ridiculously easy even with all the kids in tow. (Who will hold the coupons? The shopper cards? My reusable bags? I need minions!) And most of all, I like having ONE LESS THING ABOUT WHICH TO THINK. Yes, I’ve done some rearranging. Last week, we had pizza on Thursday and roast on Saturday. Who cares? I had all the stuff because I shopped according to the plan! So… this week, I’m-a gonna-go-a-go-a-wild-a and toss in a few desserts. We don’t eat dessert every night. But it’s nice to have some… I probably shouldn’t be doing this extra this week since I have a bunch of study coaching/SAT Prep sessions, but… I’m a wild woman… *le sigh* And next week, I just might start adding recipes. At last I am able to swallow which is helpful for eating and drinking. Staying upright at length is still a challenge, but I like challenges. The benefits of meal planning a couple of weeks ahead sure were helpful last week as we returned from a long weekend away and my being sick at the same time. No, my Husband and children didn’t follow the meal plan to a tee. That’s not the point. The point is, there was food in the house, and a plan with which to follow it if desired. Now, I realized one very lacking component. Recipes. Not that anything I make is complicated, but I believe I will now add recipes in the menu section of my binder behind the current week’s menu plan. That would have been even better. So, as I lay out this week’s menu, I am so very grateful to my Husband for his care and comfort when I was feverish, funky, and generally less than pleasant at times. I am also grateful to our children who did not destroy the house, who were quiet allowing me to rest, and for knowing how to cook. I’m not sure who taught them, but they know how. Menu Plan Monday – will I regret this? Will I regret this? I do make menu plans. But they so often change. Because it’s not what my Husband wants or the weather suggests something different… Pick a reason. I’ve used it. I’m going to do my best to stick to this plan. So determined, am I, that I am bravely joining in Organization Junkie’s Menu Plan Monday meme. Wish me luck! Oh. And since we learn at home, I plan three meals a day, not just one. And, I cook from scratch. The only thing from a box on this menu is “cold cereal.” I’ll figure it out one day, too. ADDED NOTE – I appreciate all the concern that I don’t know what I am doing. I actually do. As I said in my post, I have been planning meals for years. I just don’t always stick with the plans. The sticking with them part is the part tying a noose around my neck. I shop from my plans, prep in advance, and I don’t waste, so everything is used and is economical and very balanced and healthy. With the exception of the dogs and chips… Thank you for being concerned for me. And keep cheering me on. I still don’t like having it in writing!